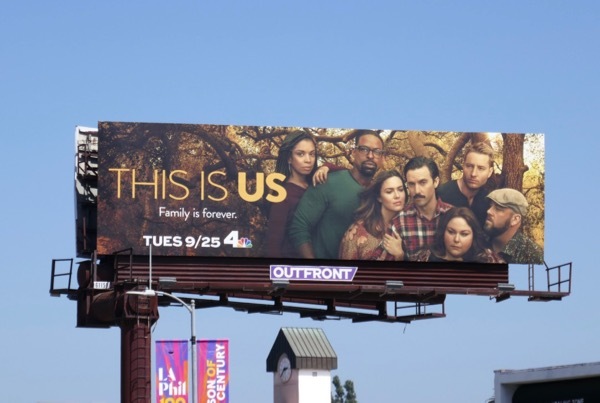 If you had any doubt that the fall TV season was on the way, then this very autumnal key art for the third season of This Is Us will hammer the point home. 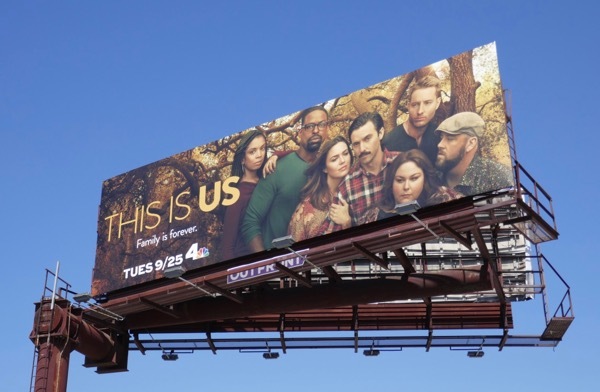 With new challengers like A Million Little Things this year, can the time-hopping, tear-jerker of a series be able to maintain its position as the best heart-warming family drama on broadcast television? 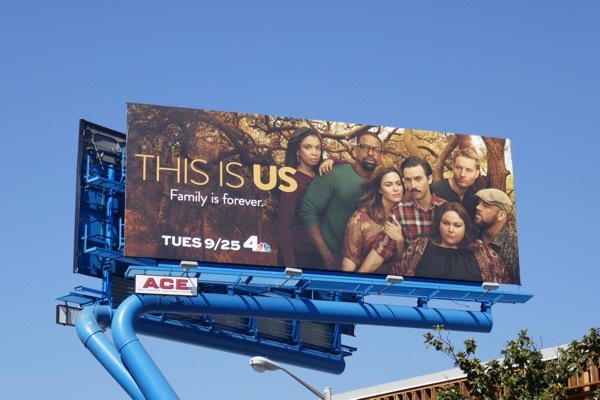 Dan Fogelman's drama about the 'Pearson' family across the ages will certainly try, especially as we'll be traveling back in time to meet patriarch 'Jack's' brother (played by Michael Angarano) in the Vietnam War, checking in on newlyweds 'Kate' (Chrissy Metz) and 'Toby' (Chris Sullivan), plus how renovations and fostering are treating 'Randall' (Sterling K. Brown) and 'Beth' (Susan Kelechi Watson) in modern times, and even hopping forward in time to see future versions of the family in the 2030s. 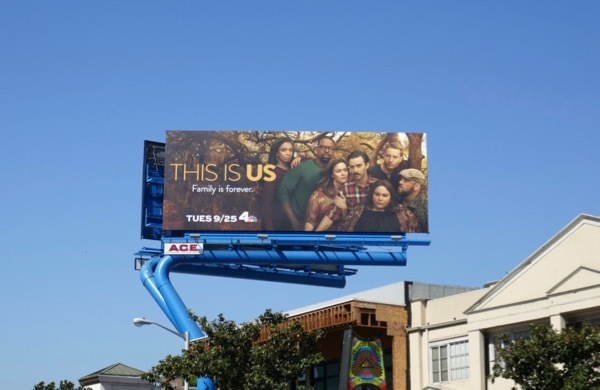 These season three billboards featuring other cast family members, 'Rebecca' (Mandy Moore) and 'Kevin' (Justin Hartley), were snapped along the Sunset Strip and Santa Monica Boulevard from September 7 to September 9, 2018. It's nice to see all the parents and grown-up children together in this ad creative, even if it never happens on screen. 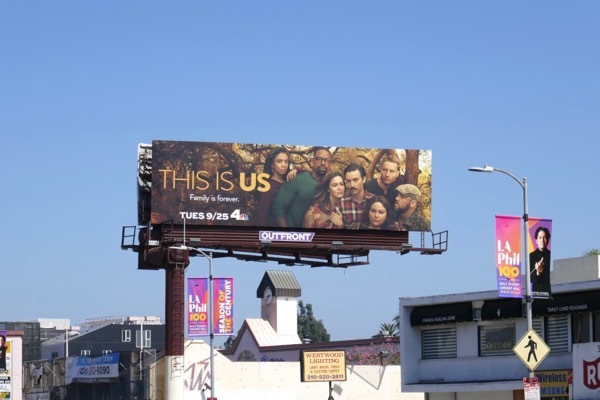 Fans of the feel-good series can also enjoy all these previous season and awards consideration billboards for This Is Us from September 2016 to date. 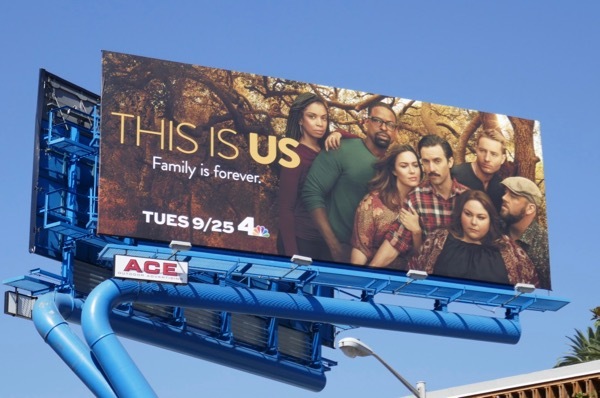 As this season's tagline suggests, 'Family is forever', especially when you can bounce back and fore through time exploring all the meaningful moments in the life of this American family.